The Comfortbilt is a simple stove that performs its job well and is backed by impressive and caring support. With 80% 5 star ratings on Amazon this is a product people are willing to get behind. And why shouldn’t they? After all, with great heating capacity, functional design, and long term reliability it’s a no brainer. Let’s jump in (figuratively of course) and see what makes this such a great stove! ✔Exceptional Heating:If there’s one thing that comes up over and over again in the reviews it’s customers raving about how well the Comfortbilt heats their home. 2,200 square feet is decent capacity, and one reviewer mentions how his 2,600 square foot ranch was kept warm and cozy all winter long! Quality of heat is one thing, but reliability is another-not all stoves (like some of the models on our homepage) can stand up to the test of long term usage. The ComfortBilt can with reviewers regularly posting updates after months or even years in some cases! ✔Design:The design isn’t the most beautiful we’ve seen but its bay windows with large glass viewing panels are pretty nice. Aside from decent aesthetics the form is pretty well conceived. There’s a handy digital control panel with a thermostat that ranges from 61-84 degrees. There is also a remote that comes with and has the same functions. ✔Customer Service:This is an area where comfortbilt truly shines. There is a single support rep for the US whose name is Glenn. This guy is the real deal. He answers all questions over the phone, sends replacement parts, responds to Amazon queries. Scroll through the reviews and you’ll see what I mean. ✔Quiet:This stove runs relatively quiet. One purchaser remarked that it sounds like a gaming pc. Overall, you may have to turn up the volume of a tv slightly, but it doesn’t seem like there are quieter stoves. ✖Hopper Filling:The hopper has a small filling hole, which requires you to rip off a corner of your bag of pellets and carefully pour the pellets inside. ✖Instruction Manual:.The manual is filled with hard to read font and tiny print. This is a small gripe..we know, but we just thought you should be prepared. ✖Burn Pot Overflow:If you run this stove on the highest setting the burn pot may overflow slightly. One solution to this is simply attach a tiny fan to the air intake port with a variable speed controller. You can then set the fan speed to a low setting (~10 CFM) and that will drastically increase the burn rate and thus prevent overflow. ♥PRO TIP: As with any stove you will have to do some cleaning. One important thing to note about this model is that there are some extra panels that can be cleaned if you pull off the silver panels on either side of the stove. If you do not clean these then the future flames will not burn as strongly. So there you have it, our Comfortbilt review outlining the key pros and cons to this highly reccomended machine. The Comfortbilt is great for people looking to buy their first pellet stove and will provide heat for years to come. 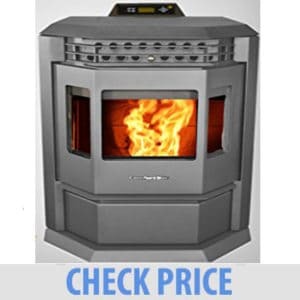 Happy stove shopping, and if you have any questions don’t hesitate to reach out!